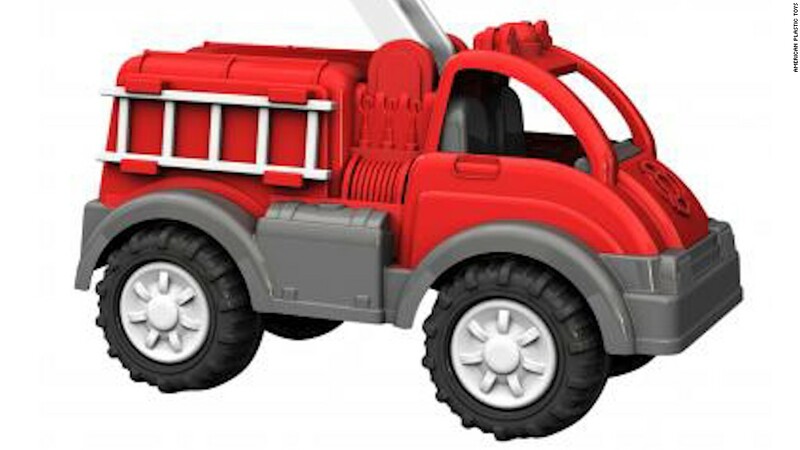 These toys are made in the U.S.
American Plastic Toys is a manufacturing anomaly. Nearly 90% of all toys sold in America are made in China. But for the last 55 years, American Plastic Toys has been making toys in Walled Lake, Michigan, a bucolic lakeside city 32 miles northwest of Detroit. 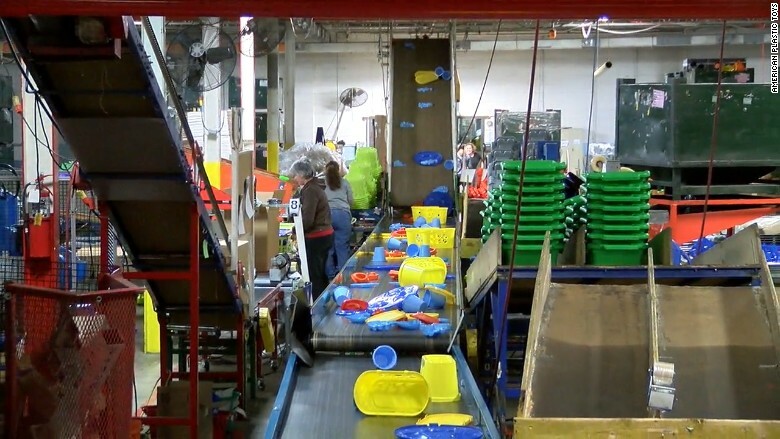 "We've been in business since 1962 and have never considered offshoring to China," John Gessert, president and CEO of American Plastic Toys, told CNNMoney. The company stuck to that pledge, even as most of the nation's toy industry shifted production overseas in the 1980s to cut costs. "It's a lot easier to run a toy factory in China where requirements like employee protections don't exist," Gessert said. The company's factories operate on a 24-hour weekday schedule. Keeping production at home allowed American Plastic Toys to maintain continuous oversight of quality and integrity, he explained. When the company thought about sending its product molds overseas, they feared they would lose control of the designs and risk intellectual property loss if they didn't get the molds back. Related: Chicago factory's rare mission: Manufacture eyewear in U.S. So American Plastic Toys stayed American. The company employs 300 workers across five facilities in Michigan and Mississippi, and its factories run on a 24-hour weekday schedule. American Plastic Toys makes more than 300 different toys for toddlers and preschoolers: plastic pail-and-shovel sets, cars, trucks, play kitchens, dollhouses, wagons, and toy strollers. They're sold in stores like Wal-Mart (WMT) and Walgreens (WBA). All of the plastic is bought domestically, said Gessert, and only 10% of toys include imported parts. The toys' prices start at $2 and cap at $100. The company is profitable, though Gessert declined to share specific financial information, and full-time employees receive a benefits package including healthcare and a 401(k). "We're one of the most consistent employers in 50 years and probably the longest-running employer in the communities surrounding all three of our main facilities," said Gessert. The company employs 300 workers. Pat Hebert, facility manager, has been with American Plastic Toys for 29 years. His is one of many multi-generational families. "We have several employees who've been with us for over four decades," he said. Hebert's father helped set up a company factory in Rose City, Michigan, in the 1970s. It's where Hebert eventually joined him, first spending summers and learning the ropes of handling stock, molding and assembly line production. Related: Chinese manufacturers are setting up shop in the U.S. In Walled Lake, a city of about 7,000, American Plastic Toys is a source of pride and a symbol of resilience. The 280,000 square-foot plant is the largest building in the small community. The outskirts of town are dotted with firms servicing Detroit's automotive industry, but the area lacks much other industry. American Plastic Toys also works with area colleges to bring in interns, ensuring a future pipeline of workers. Not offshoring has helped ensure longevity, Gessert said, as American Plastic Toys can "control the production process from start to finish." Staying close to its main market has also helped the toymaker to be nimble: The manufacturer refreshes its product mix twice a year and can quickly react to market trends. It's able to reduce costs by selling a higher volume of products, as bulk production is less expensive than manufacturing multiple small orders. 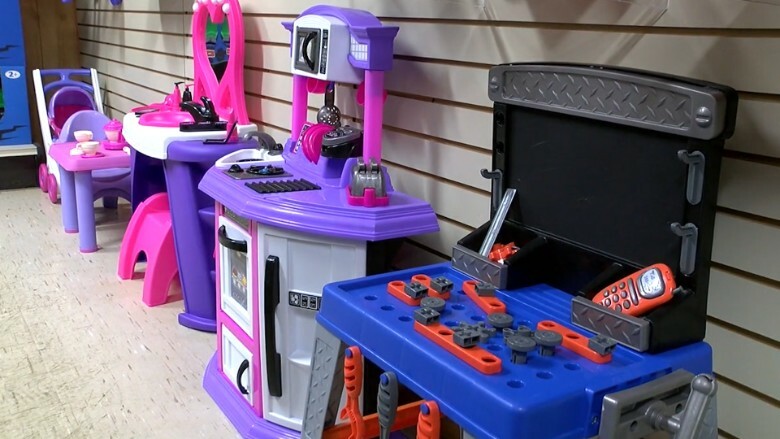 The toymaker makes a variety of toys like plastic dollhouses, kitchen sets and trucks. The company also tweaked its production strategy over time in a "defensive move," Gessert said. "We shifted our toy mix from small labor-intensive items to larger items like kitchen sets that needed less labor to make." Looking forward, Gessert wants to keep innovating. "The toy business is seasonal. So you have to figure out how to keep your workers busy 12 months of the year," he said. One idea: Expand outside of toys into home-focused products. "It's important to not have tunnel vision but stay agile and try new things," he said.